That's right...an all-wheel-drive TDI powered sports car. I have lofty goals for this machine - Haldex Quattro AWD system, 40+mpg, and 300hp/450ftlbs via a fully prepared, compound forced induction, ALH motor. Right now, it's running on hopes and dreams, but scroll down for the latest. While the Cosworth 1.8 liter 225hp turbo gasoline motor is nice enough; it doesn't make great power until 4000 RPM, and with economy in the 22mpg range, it isn't what I'm looking for. Okay, gasser motor removed. Time for a quick reality check...Yep, the TDI will fit! 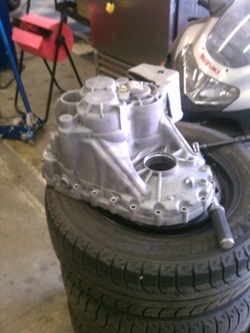 Gearing - The factory trans will bolt up to the TDI block, but at freeway speed, the revs will be far too high. We need to build the TDI ratios into the AWD transmission case. 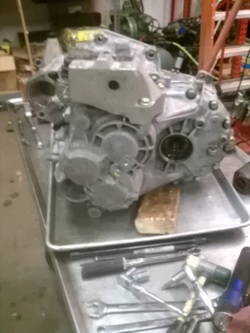 Pictured left: a 6 speed European 2WD TDI trans which will donate its guts to the Audi Quattro case. 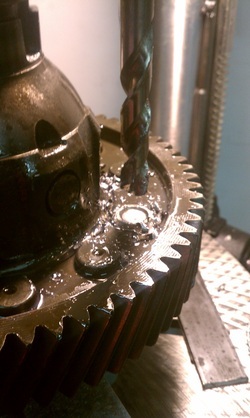 Removing the final drive ring gear from the 2WD differential, a tedious process. If we're building a trans, might as well do it right. 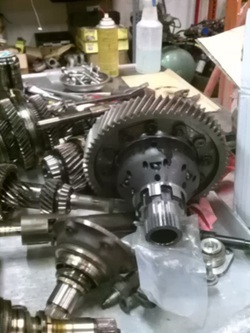 Pictured right: the TDI final drive ring gear bolted up to a Peloquin limited slip differential amongst the other TDI shafts, ready to go together. Differential, gear stacks, and shift forks installed. Time to seal the cases. 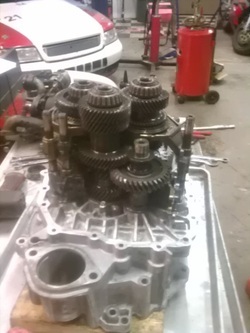 AWD TDI trans all together. 2nd stage, high pressure, turbo from Kerma; no detail photos or numbers for confidentiality. 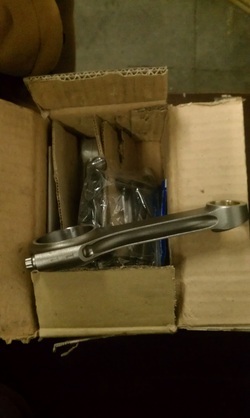 Rosten H-Beam forged connecting rods. 18:1 compression ratio PD150 pistons.